The green-lipped mussel Perna viridis (L.) were collected from four sampling locations of the Maheshkhali channel, Cox’s Bazar, Bangladesh to determine the concentration level of zinc (Zn), copper (Cu), cadmium (Cd) and lead (Pb). The concentrations (μg/g dry weight) of these trace metals ranged from 28.12 to 33.82 for Zn, 7.26 to 8.81 for Cu, 0.04 to 0.08 for Cd and 0.19 to 0.75 for Pb. The concentrations of trace metals in the mussel tissue were found at lower level than the permissible limits for human consumption. In addition, these metal concentrati-ons are also considered to be low when compared with regional data using P. viridis as a bio-monitoring agent. Most of the coastal area of the world has been reported to be threatened by different sources of contaminants and the major concerns are inclu-ded persistent organic pollutants, nutrients, oils, radio-nuclides, trace metals, pathogens, sedi-ments, litters and debris (Williams, 1996). Most of the contaminants are interrelated and jeopardi-ze the environment and aquatic organisms at a same way (Phillips, 1985). Therefore, the control of aquatic pollution has been identified as an immediate need for sustainable management and conservation of the existing fisheries and aquatic resources. P. viridis is widely distributed in the coastal wa-ters of the Asia-Pacific region (Tanabe, 2000). A good number of studies have been used P. viridis as a bio-monitoring agent for trace metals inves-tigation since P. viridis are sedentary long-lived organisms, easily identified and sampled, reason-ably abundant, have good net accumulation ca-pacities and tolerant ability in environmental fluctuations (Yap et al., 2004). The determination of contaminant levels in mussel provides a means of assessing the possib-le toxicant risk to public health. P. viridis is widely consumed bivalve in the south Asian co-untries (Phillips, 1985; Farrington et al., 1987). The local indigenous people of the Maheshkhali Island collect this species for consumption from the inter-tidal zone of this channel system. The Maheshkhali channel is very important as a large fishing ground and a centre for recreation. On the other hand, the Bakkhali River opens into this channel, which brings much of the domestic, ag-ricultural and industrial wastes. A good number of fishing trawler and mechanized boat and speed boats move through this channel every day. Mo-reover, many passenger boats from different pla-ces come to the jetty along the Maheshkhali channel. Therefore, oil spill and unused fuel from these vehicles finally goes into the water and continuously polluted the water which might re-sult in increasing trace metals in the water co-lumn of the Maheshkhali Channel. Moreover, P. viridis can easily accumulate trace metals in their body from the ambient water and food. Some me-tals, such as Cd and Pb, have long been known to accumulate within the aquatic food chain. Since Cd, Cu, Pb and Zn are widely distributed in the coastal environment, both from natural geologi-cal processes and anthropogenic activities. Mus-sels are well known to accumulate a wide range of contaminants in their soft tissues (Goldberg et al., 1978). The intertidal areas are the natural ha-bitats of marine mussels, but they are usually clo-se to estuaries. Therefore, the chance of exposure to several contaminants from the land-based acti-vities is high through the riverine system as well as sea-based sources. Marine mussels provide a cheap source of protein for human consumption. For P. viridis, it had been reported that there was about 60% pro-tein in every 100 g (dry weight) of mussel soft tissues (Choo and Ng, 1990). From the nutritional point of view, the mussel is an important food source for supplying essential trace metals (e.g. Ca, Fe) and certain vitamins such as niacin, thia-mine and riboflavin (Cheong and Lee, 1984). From the toxicological point of view, excessive consumption of metal-contaminated seafood may cause toxicity to humans. Since trace metals are inorganic chemicals that are non-biodegradable, cannot be metabolized and will not break down into harmless forms (Kromhout et al., 1985), the measurement of levels of metals in the soft tis-sues of P. viridis is becoming more significant. They can simply accumulate through time, be-coming less and more of a toxic threat as their concentrations increase. Levels of metals above the permissible limits would certainly create a notorious food image to the consumers. Chronic exposure to trace metals such as Cu, Pb and Zn is associated with Parkinson’s disease and the me-tals might act alone or together over time to cause the disease (Gorell et al., 1997). However, the major objective of this study was to determine the concentrations of trace metals (Cd, Cu, Pb and Zn) in the soft tissues of P. viridis collected from the Maheshkhali channel, Cox’s Bazar and the present study was also aimed to investigate whether these metals are within the permissible limits for human consumption. 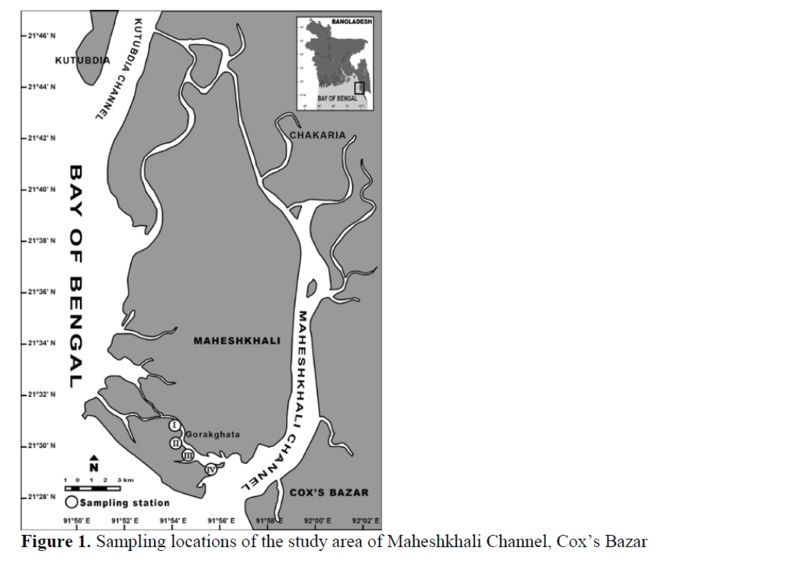 The Maheshkhali channel is located at the so-uth-eastern coast of the Bay of Bengal (Figure 1). Maheshkhali channel heavily influenced by mon-soonal wind and the geographic location of the study area were 21° 27′ to 21° 31′ N and 91° 54′ to 91°56′ E. Four sampling sites were selected at Guruk Ghata area considering the abundance of green mussel P. viridis and due to trace load of domestic effluents and other pollutant sources. The samples were collected from January to Feb-ruary 2012. During the sampling period water temperature were recorded ranged from 21.0-21.5°C, salinity 29.20-30.10 ppt. and water transparency were observed 28.80-29.50 cm. Temporal variations in the bioavailability of trace metals in the marine environment are af-fected over time of total ambient metal load. Therefore, trace metal bio-monitoring needs to conform to certain required characteristics, not least being metal accumulators. Sampling was conducted from a rented boat with local boatman to assist collecting green mussel (P. viridis). Green mussels were randomly collected from each sampling sites at the low tide. Mussel sam-ples were cleaned to rid of debris sessile flora and fauna with seawater in sampling area. Total 36 mussels were collected and kept cool in an ice-box in the field. Upon return to the laboratory, specimens were immediately frozen at -20° C prior to tissue preparation. In the laboratory, the whole soft parts of the mussel were separated carefully from the shell to avoid metal contamination. The soft parts of each mussel were homogenized in a glass blender with a stainless steel cutter and divided into two parts. One part was used for determine the moisture content by drying at 80-900C for 48 hours or until a constant weight was obtained to convert wet weight to dry weight and the other part was used for trace metal analysis by acid digestion. For the digestion of mussel samples, some 10.0 g of dried and homogenized mussels were weighed and placed into an acid washed PTFE digestion vessel. The digestion of total mussel (fraction <63 μm) were performed with a mixture of HNO3-HCl-HF (concentrated, Merck) at hot plate and cooling system (US EPA, 1999). Samp-le solutions were analyzed for trace metals fol-lowing flameless atomic absorption spectropho-tometer (Hitachi Z 9000). Dilute the standard solutions to a concentra-tion about ten times that which was determined in samples (Table 1). Dispense measured aliquots of solution (say, 2, 6, 8 and 10) into small volumet-ric flasks (25 ml) in order to cover the working range for AAS, using a pipette and clean volu-metric flask. Make up to the mark with 5% nitric acid as before. Record the concentrations of these in μg/L. For the determination of calibration plot of absorbance flame atomic absorption spectropho-tometer (Hitachi Z 8230; the model SSC 300) for Zn and Cu and flameless atomic absorption spec-trophotometer (Hitachi Z 9000) for Cd and Pb were used. The wavelengths of the most sensitive lines from the hollow cathode lamps (HCL) were 228.8, 217.0, 213.9 and 324.7 nm for Cd, Pb, Zn and Cu, respectively, and adjusted to the correct sensitivity according to the manufacturers’ in-structions. About 2 g homogenized dry meat of green mussels were divided in to two parts. The first sample part (1 g dry weight) was added with 1000 μg of each Cd, Pb, Zn and Cu. The other parts of sample (1 g dry weight) were not added with Cd, Pb, Zn and Cu. Both of sample parts were digested in the process of trace metals ex-traction in green mussel and the filtrate solutions. The trace metal concentrations in the soft tis-sue of P. viridis were slightly varied among the stations. The concentrations of Zn, Cu, Cd and Pb in the mussels collected from different locations of Maheshkhali Channel are shown in Table 3. The mean concentrations ranged from 28.12-33.82 μg/g (dry weight basis) for Zn, 7.26-8.81 μg/g (dry weight basis) for Cu, 0.04-0.08 μg/g (dry weight basis) for Cd and 0.19-0.75 μg/g (dry weight basis) for Pb (see Table 3). The variation of mean concentrations of trace metals among the stations are shown in Figure 2. 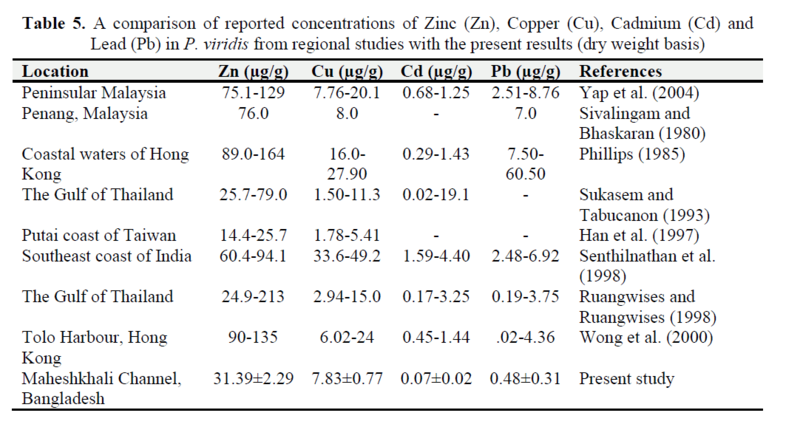 Table 3: Concentrations of zinc (Zn), copper (Cu), cadmium (Cd) and lead (Pb) in the soft tissues of P. viridis (dry weight basis) collected from the Maheshkhali Channel, Cox’s Bazar, Bangladesh; Replicate, n= 4. The guideline on trace metals for food safety set by different countries are presented in Table 4. In comparison with the permissible limit set by were measured by flame atomic absorption spec-trophotometer (Hitachi Z 8230 the model SSC 300) for Zn, Cu and flameless atomic absorption spectrophotometer (Hitachi Z 9000) for Cd and Pb. The concentrations of each trace metal in both samples were compared to determine the percent recovery of the analysis. Detection limits for a number of common el-ements were determined by flame atomic ab-sorption and compared them with those obtained with other atomic absorption methods (Table 2). Under usual conditions, the relative error of fla-me absorption analysis was 1-2%. All calculations were based on dry weight of tissue. Mean concentration of the metals and standard deviation were estimated using the Sta-tistical Package for Social Science (SPSS 16.0) program. All the statistical significance was test-ed at 95% confidence level. The Ministry of Public Health of Thailand (MPHT, 1986), all the mean values of the present study (μg/g, dry weight basis) from all the samp-ling stations were lower than the limits. The con-centration levels were also lower than the re-commended guidelines for Cd, Pb, Cu and Zn set by the USFDA (1990), the Australian Legal Re-quirement for food safety (NHMRC, 1987) and the limits established by the Brazilian Ministry of Health (ABIA, 1991) (Table 4). As for the status of the ‘increased contamination’ reported by ICES (1988), the Cd levels of the present study were lower than the ‘increased contamination’ level (1.80 μg/g dry weight basis) for Cd and (3.00 μg/g dry weight basis) for Pb (Table 4). The mean concentrations of Zn (31.39±2.29 μg/g), Cd (0.07±0.02 μg/g) and Pb (0.48±0.31 μg/g) found in this study were lower than the previous investigations on P. viridis from Penin-sular Malaysia, coastal water of Hong Kong, the gulf of Thailand, southeast coast of India and To-lo Harbour of Hong Kong (Phillips, 1985; Suka-sem and Tabucanon, 1993; Senthilnathan et al., 1998; Wong et al., 2000; Yap et al., 2002, 2004). Although the mean concentration of Cu (7.83±0.77 μg/g) was higher than some other previous studies from different part of the world, but this concentration level is lower than Penin-sular Malaysia (7.76-20.1 μg/g), coastal water of Hong Kong (16.0-27.90 μg/g) and southeast co-ast of India (33.6-49.2 μg/g) (Phillips, 1985; Senthilnathan et al., 1998; Yap et al., 2004). A comparison of reported concentration levels of zinc (Zn), copper (Cu), cadmium (Cd) and lead (Pb) in P. viridis from regional studies with the present result are presented in Table 5.
seen in children and acute effects of Pb might ca-use coma and death to the affected person (Hut-ton, 1987). An adult who consume 10 g/day of P. viridis daily from the Maheshkhali channel would intake 4.8 (0.48×10=4.8) μg/g of Pb each day. If the consumer continue to consume this mussel for 7 days, then they would consume 33.6 μg/g Pb, which is still lower than the recommen-ded limit for the provisional tolerable weekly in-take of Pb (50.0 μg /adult) (FAO/WHO, 1984). Similarly, if an adult consumes approximately 10 g of mussels per day, then the person who consumes mussels collected from Maheshkhali channel would intake 0.6 (0.07×10=0.7) μg/g of Cd each day. If the consumers continue to take the mussel for 7 consecutive days, then they would intake 4.9 μg Cd. Again, this consumption level is also lower than the recommended limit for the provisional tolerable weekly intake of Cd (6.70-8.30 μg/adult) (FAO/WHO, 1984). The elimination rate of Cd is very slow (an average 2.00 μg/day) in human body. Moreover, prolon-ged excessive Cd ingestion would cause Cd ac-cumulation inside the human body (Filov et al., 1993). The acute toxic symptoms of higher con-centration of Cd ingestion are nausea, vomiting, diarrhoea, headache, abdominal pain, muscular ache, salivation and shock (Patnaik, 1992). By using P. viridis as a bio-monitoring agent, the contamination of Cd, Cu, Pb and Zn in the Maheshkhali channel was found not to be seri-ous. The results of the study revealed that the possibility of the occurrence of acute toxicities of Cd, Cu, Pb and Zn is unlikely. However, low-level and chronic toxicities to consumers may still pose an irreversible hazard. Since, P. viridis accumulates trace metals in the soft tissues and constitutes one of the important food-chain in the coastal environment; this information is therefore useful for predicting the metal contamination in this coastal communities. In addition, the trace metal concentrations in the mussels from the Ma-heshkhali channel could be attributed to natural or anthropogenic metal sources affecting their habitats. However, future studies should concent-rate on the relative importance of water, sediment and food in the accumulation of metals by the mussel. ABIA (Brazilian Association of Food Industries) (1991). Acts of the Ministry of Sau’de: Compendium of the legislation on food. Technical report, Brazilian Ministry of Health, pp. 48. Blackmore, G., (1996). Bio-monitoring of heavy metal pollution in Hong Kong coastal wa-ters, using barnacles, Asian Marine Biology, 13: 1-13. Blackmore, G., Chan, H.M., (1998). Heavy metal concentrations in barnacles (Tetraclita squamosa) in Hong Kong: a revisit. In: Mor-ton, B. (Ed. ), The Marine Biology of the South China Sea, Proceedings of the Third International Conference on the Marine Bi-ology of the South China Sea, Hong Kong, 28 October-1 November 1996. Hong Kong University Press, Hong Kong. Chan, H.M., (1988). A survey of trace metals in Perna viridis (L.) (Bivalvia: Mytilacea) from the coastal waters of Hong Kong, Asian Ma-rine Biology, 5: 89–102. Cheong, L., Lee, H.B., (1984). Mussel farming. Satis Extension Manual Series. No. 5. Bang-kok: Southeast Asian Fisheries Development Centre. Choo, S.E., Ng, C.S., (1990). Enzyme hydrolysis of green mussel (Perna viridis) to produce an enhanced taste extract, Singapore Journal of Primary Industries, 18: 48-53. Chong, K., Wang, W.X., (2000). Assimilation of Cadmium, Chromium, and Zinc by the Green Mussel Perna Viridis and the Clam Ruditapes Philippinarum, Environmental Toxicology and Chemistry, 19(6): 1660-1667. FAO/WHO, (1984). Lists of contaminants and their maximum levels in foods. CAC/Vol XVII (1st ede.). Filov, V.A., Ivin, B.A., Bandman, A.L., (1993). Harmful chemical substances. New York: E Horwood. Hutton, M., (1987). Human health concerns of lead, mercury, cadmium and arsenic. In E. C. Hutchinson, and K. M. Meema (Eds. ), Lead, mercury, cadmium and arsenic in the environment, SCOPE 31. Chichester: John Wiley and Sons. ICES (International Council for the Exploration of the Sea). (1988). Results of 1985 baseline study of contaminant in fish and shellfish. ICES Coop, Research Report. MPHT (Ministry of Public Health, Thailand). (1986). Residues in foods, Part 23, vol. 103 (pp. 1123–1124). Special Issue, 16 February, 1986. The Government Gazette, Bangkok, Thailand. NHMRC (National Health and Medical Research Council), (1987). National food standard A 12: metal and contaminants in food. Canber-ra: Australia: Australian Government Pub-lishing Services. Patnaik, P., (1992). A comprehensive guide to the hazardous properties of chemical substances. New York: Van Noatrand Reinhold. Rainbow, P.S., Smith, B.D., (1992). Biomonitor-ing of Hong Kong coastal trace metals by barnacles. The marine flora and fauna of Hong Kong and southern China. In: Morton, B. (Ed. ), Proceedings of the Fourth Interna-tional Marine Biological Workshop: The Marine Flora and Fauna of Hong Kong and Southern China, Hong Kong, 11–29 April 1989. Hong Kong University Press, Hong Kong. Ruangwises, N., Ruangwises, S., (1998). Heavy metals in green mussels (Perna viridis) from the Gulf of Thailand, Journal of Food Pro-tection, 61: 94-97. Senthilnathan, S., Balasubramanian, T., Venu-gopalan, V.K., (1998). Metal concentration in mussel Perna viridis (Bival-via/Anisomyaria) and oyster Crassostrea madrasensis (Bivalvia/Anisomyaria) from-some parts in southeast coast of India, Indi-an Journal of Marine Sciences, 27: 206-210. Siddique, M.A.M., Aktar, M., (2012). Heavy metals in salt marsh sediments of Porteresia bed along the Karnafully River coast, Chit-tagong. Soil and Water Research, 7(3): 117-123. 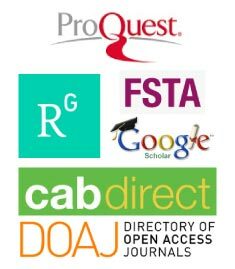 USFDA (Food and Drug Administration of the United States). (1990). US Food and Drug Administration Shellfish Sanitation Branch, Washington, DC. Williams, C., (1996). Combating marine pollu-tion from land-based activities: Australian initiatives, Ocean and Coastal Management, 33(1-3): 87-112.